Following the HP 95, 100 and 200 series, HP’s calculator division devised the OmniBook 300, an ultra-light yet ultra-portable computer, the smallest of its time. Let’s have a closer look at a later generation model, the 800CT. Since the initial release in 1993, the OmniBook has made quiet some developments. The first version ran on a 386 CPU and brought a companionship of software in ROM. In that respect similar to earlier HP 95 / 100 / 200 series, it was a huge leap forward, as it sported a fullsize keyboard and a fully VGA-compatible display. 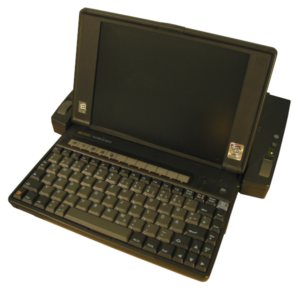 With it’s bundled set of DOS 5, Windows 3.1, Word and Excel, the OmniBook marked a milestone in mobile computing, today being attributed the first ever subnotebook. One of the distinct feature of the OmniBook Series over all incarnations from the first 300 up to the latest 800 model, was the pop-out mouse. It was hidden in a small compartment on the right side of the notebook, and would pop-out upon an button press. This was very unique and distinct feature when compared to the usual trackball or trackpoint devices found in competing products. The device in my collection is a 800CT, a later generation model of around 1996. While it’s no comparable match for the Toshiba Libretto 50CT in terms of size, the power lies elsewhere. 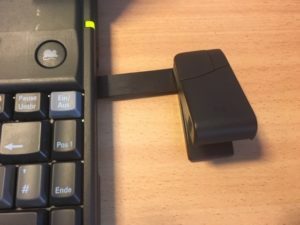 As it’s predecessors, it offers the unique pop-out mouse, a full size keyboard, a 800×600 capable SVGA color TFT display, and a quiet powerful Pentium MMX clocked at 166 MHz at it’s heart. With the still new MMX CPU causing lockups with the RTM version of Windows 95, the OmniBook was released with Windows 95, OEM Service Release 2. Long gone where the days of software in ROM, the 800 (as its intermedia predecessors) offered a built-in harddrive, to which the operating system, alongside with companion software, was installed. Targeted at the business market, the OmniBook dock was available as an accessory, offering many connection offers for permanent desktop use, plus an internal expansion port, which could be fitted with either a 16bit ISA or a 32bit PCI adapter. The optional floppy and CD-ROM drives being were built into external enclosures and could be connected to either the OmniBook or the dock. So with the choice to carry them along, or not, the OmniBook was a good match on the go. The PHINTAGE Collection currently holds an HP OmniBook 800 CT. There is currently no downloads in this section.